HomeRubber Bracelet WristbandsStars and Stripes American Flag Rubber Bracelet Wristband - Adult 8"
Buy our Stars and Stripes American Flag Rubber Bracelet Wristband and display All American stars and red stripes. Our Stars and Stripes Rubber Bracelet Wristband is made from 100% Silicone Rubber. This seamless Rubber Bracelet Wristbands comes packaged in an individual polybag. Printed with white on 2 colors of rubber for a patriotic message - the two colors of rubber mix together at the edges - each one has a unique look. Some others are all blue rubber with white and red ink to achieve a similiar look - we'll pick which ones you get. 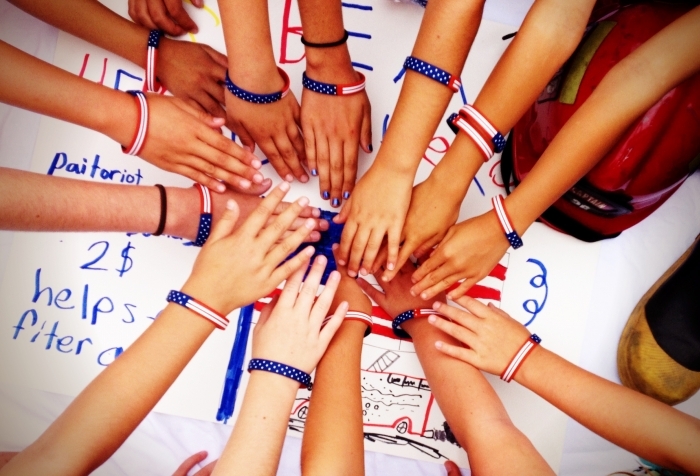 These patriotic wristbands look great and have been a fantastic way to fundraise at my elementary school in support of a local 9/11 Memorial Stair Climb. I would highly recommend purchasing the "youth" size for smaller children like kindergarteners/first graders, yet all other students did well with the "adult" size. I will continue to purchase from the Support Store in the future! Best UsesFundraising for patriotic events. I really like the way they are made. One piece, no seam, I hope as you said it is. Bought 100 of these to give as I SEE fit. I feel they are better made than others (ones representing cares). Those have split on me telling me they were not a single/one piece. I like so far and others are gratefull. Lasts 3-6 months of continuous wear before stars and stripes start to fade. Well worth it for $2.50. Bought several of these bands to give to my veteran friends in celebration of our American ideals. Wrist band was a gift for my husband. He wears it all of the time. I would say he really likes it! Great quality and service! This is a high quality item for a reasonable price! We looked everywhere for these and couldn't find them locally. My husband went online and found that you have an assortment of them, so we ordered enough to last us a long time. They are just what we were looking for! These bracelets are really nice. The quality is much better than I expected. Each bracelet comes individually wrapped so no sticking together like some I've seen. They fit adults comfortably too. i love these things. a simple way to show support for the men and women doing what must be done, at great personal cost. I give these stars and stripes away, the more the merrier! Best Usesgive them to others - show our support to our own! Fabulous! 2nd time buying, LOVE 'EM!